Handcrafted in the United States from hand-selected hardwood, the Vineyard High Dresser is unrivaled in beauty and strength. This heirloom dresser will be in your family for generations. Featuring the naturally beautiful characteristics of North American hardwood, simple curved styling and sleek ebony inlays, the Vineyard High Dresser will add the perfect touch of elegance to any bedroom decor. 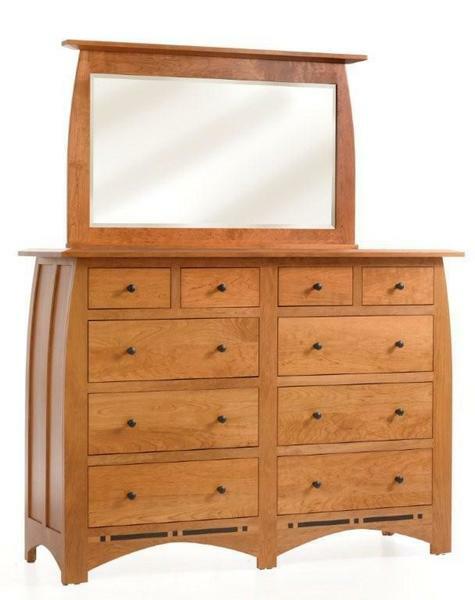 With many different wood and finish options, the optional aromatic cedar bottoms for your drawers and the TV Mirror, the Amish Vineyard High Dresser can be customized to fit your needs. Call one of our Amish Furniture Specialists today with any questions or to help you with your order, toll-free at 1 (866) 272-6773!